These Animal Reiki training courses are run by Annie Robertson, Reiki Master/Teacher, in association with Sarah Berrisford. Sarah has put this course together through her experiences of sharing Reiki with animals. Read student testimonials here: Animal Reiki Course Testimonials. The Animal Reiki Courses are open to anyone who has completed Reiki 1st Degree (through any lineage). One must complete the Foundation Animal Reiki Course before moving on to the Animal Reiki Advanced Practitioner Course. Students may attend the courses on consecutive days or with their course dates further apart. The maximum number of students per course is 4. Experience with animals is not essential in order to attend, so long as course participants have a love for animals. The main theme of this course is to focus on the approach we take when giving Reiki to animals, allowing our intuition and the animals behaviour to guide our decision. 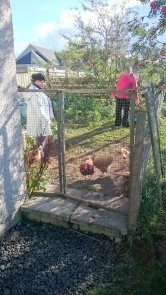 The course consists of 1 full day of practical training and during the day you will be working with dogs, horses and chickens; all on a 1:1 basis. A manual, ‘The Complete Guide to Animal Reiki’, written by Sarah Berrisford, is provided before the course. This manual serves both courses and is the perfect course companion. The ‘Animal Reiki Advanced Practitioner Course’ is the next step in using Reiki with animals. 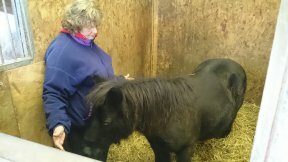 The Advanced Practitioner course is for people wishing to learn more techniques and further themselves in the field of Animal Reiki. The Advanced course consists of one full day, plus re-reading ‘The Complete Guide to Animal Reiki’. This course consists of 1 full day of practical training, plus 3 case studies to be completed after the course on animals of your choice. On completion of this course, persons with Reiki 1st degree plus Animal Reiki can work on their own animals. Students with Reiki Second Degree plus Animal Reiki could work on the public’s animals, providing they have the appropriate insurance. All courses are accompanied by an attractive certificate provided by Annie Robertson. The Coupar Angus venue is situated in the beautiful village of Campmuir on the outskirts of Coupar Angus in the Perth and Kinross district. The fee for the either Animal Reiki Course (Level 1 or Level 2) is £177, with a £42 deposit paid in advance, and the balance paid to Annie Robertson on the day of your course. Payment by cash or card is accepted. Open to anyone who has completed Reiki First Degree. Open to anyone who has completed Reiki First Degree and the Foundation Animal Reiki course. Once you’ve been on your Animal Reiki course we want you to know that your teacher will be on hand to deal with any questions or queries that you might have at any point in the future. Sarah Berrisford offers free advertising on her website for Animal Reiki Practitioners who have trained with Annie. 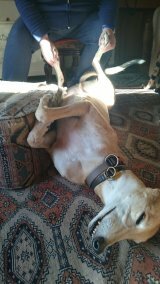 Annie will also send out handy Animal Reiki Leaflets and Animal Reiki Review Sheets for you to use as you wish once you have completed the course. “It has been an amazing weekend in Coupar Angus where I attended the foundation and advanced animal Reiki course. The location is beautiful and I felt very welcome and the training was done in a very relaxed way. Annie understands her subject very well, she explained everything in a simple but effective way and gave us enough time for hands on experience. The book that I got to work through before the course i found very interesting and helpful. At times it was emotional but extremely humbling and rewarding. Most of these animals are rescue animals and despite what they have been through they trust us and give back so much love and healing too. It was amazing to experience how they embrace the energy and how we are able to connect and communicate with them. “I can highly recommend both the foundation and advanced Animal Reiki courses, having completed both. 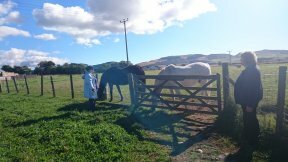 Although I have always given my horses and other pets Reiki prior to these courses, I now feel that I can communicate with them at a much deeper level. Annie has a very relaxed teaching style and is open to any questions – of which I had many! The animals you get to work with are amazing, some of whom have had the most awful start in life, but despite this have so much love to offer. The book that accompanies the courses makes for a very interesting read and can be used again and again for reference. Annie also offers ongoing support should you need it.